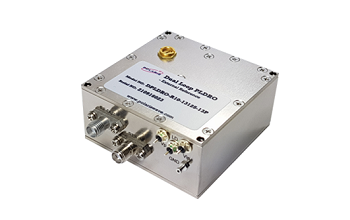 The Dual Loop PLDROs provide an output frequencies whose phase is locked to an integer or fractional multiple of the external reference using PLCRO (Phase Locked Coaxial Resonator Oscillator) and frequency divider. This series provide output frequency from 5 GHz to 13 GHz with 500 KHz frequency resolution. For more finer frequency resolution, please refer to Single Loop Digital-PLDRO..